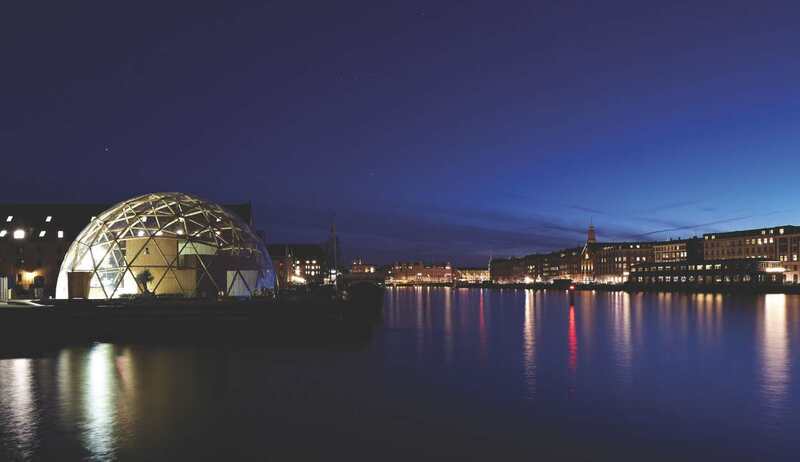 Over the last couple of months a large transparent dome that functions as a greenhouse has appeared on Krøyers Plads, Christianshavn. Inside you will find a two-storey house with open windows and doors in the midst of an embracing garden with wine and peach trees and humble bees. Is this how we will live in the future? Can we find some of the answers to the future resource scarcity and climate change here? How can the outburst of creative and temporary life in-between bring quality into the permanent site? What can we learn? NCC, Tejlgaard and Jepsen and House of Futures co-creatively tests one of Buckminster Fuller’s most provocative and inspiring ideas and visions – and we welcome you in the Dome of Visions on the dome’s last day in Copenhagen. Download the invitation to Futures’ Day 3 May or see program below. Registration is not necessary. “We are called to be architects of our future, not its victims”. Buckminster Fuller believed in us, in humanity’s ability to create the future we want. All over the world people have been inspired by his thoughts and creations and by his work and ideas on creating a sustainable planet that are as influential as ever. Our time might not look as Buckminster once imagined, but he surely created a parade for others to join. The future is always different from the past, and that’s why we need pioneers. On this Futures’ Day we are celebrating Fuller for his visions and the people that have the courage to stand up for something that they really believe in – even when others label them as crazy, misfits, outsiders, rebels. For all Dome-people and friends of the future now – join in!